As adults do we play? As adults do we play? One thing I love about my job is hearing what children say. I have heard 4 yr olds over the last few weeks tell me that adults don’t play. Play in the early years is vital, play in all of childhood is vital but it is still (at the moment) recognised in the early years as the main way children learn. As an early years worker playing is an essential skill, so hearing children say that adults don’t play is possibly suggesting they are not seeing a lot of play from the adults around them, which is worrying. A new advert has come out recently from Ikea. It asks children to write a letter to the Three Kings (Sweden’s equivalent to Father Christmas) saying what they want for Christmas. It then asks the children to write a letter to their parents, saying what they want from their parents. Lots of the children say in the letter to parents, play with me more. I am pretty sure this was set up and scripted, but I know from research I was involved in gathering for The Children’s Society’s Good Childhood Inquiry, that children often say they want adults to spend more time with them and to play with them. This leads me to the question, do we still know how to play? How playful are we? What do we do in our lives that is playing? For me playing is something which is not work, it is something which brings me pleasure and joy. Play is something I can lose myself in and there doesn’t have to be a result at the end. I play a lot in my job, this week I have been playing Superheros (happy and sad ones). I have been playing with jelly and squirty cream and playing with fuzzy felt faces, but this is work for me. It’s great work but it’s not really playing I would choose! The type of play I would choose is crunching through leaves in the meadow behind our house. I never tire of the sound of walking through leaves, and noticing the changes in the meadow. The type of play I would choose is swimming. I swim every weekday early morning, I love the rhythm and the feel of gliding through the water. The type of play I would choose is Reading. Although this is not an active play thing, it is something which brings me great pleasure, in which I can lose myself and relax. The type of play I would choose is Felting. This is a creative play activity for me, which I learnt a few years ago. The joy of felting for me is the process, it’s often not about the finished piece. 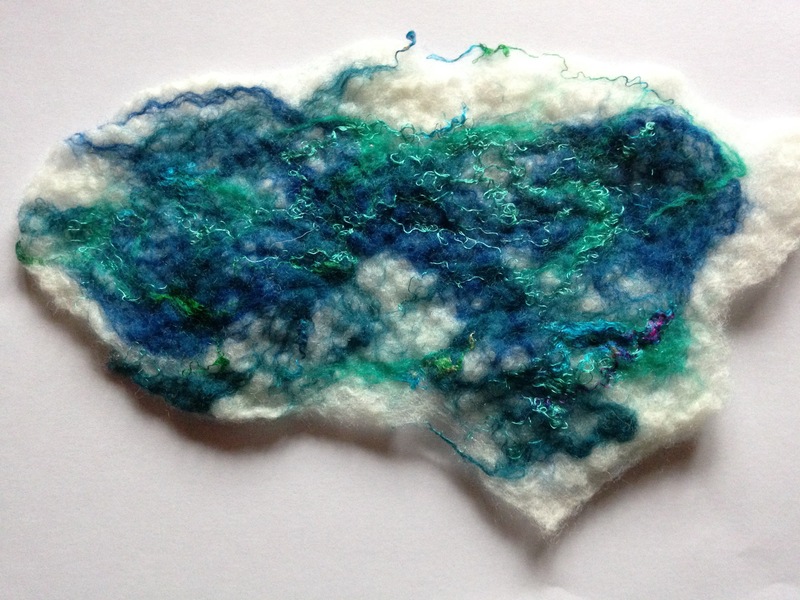 Most of the felting I do is abstract, its about exploring and playing with colours and fibers. I love how you never really know what you will end up with when you are felting, the piece at the beginning looks very different to the piece at the end. Within the world of early years, we need to make sure we are playing with our children and not just observing their play. As parents, we need to play more with our children, on things that they choose. As adults we need to find time to play, doing things that bring us joy. Finally, half term has arrived, it has felt like a long term. Using emotion language and acknowledging feelings and emotions has become a vital part of my work in the last year, and particularly this term. Many of the children I work with don’t have the emotional vocabulary they need, and many of them have very strong emotions and feelings that they need to express. I and the staff in schools spend a lot of time using emotion language, recognising when the child is deeply sad or angry and using those words to explain to them what is happening. This can be powerful and slowly helps children to understand what is going on in their bodies and minds. 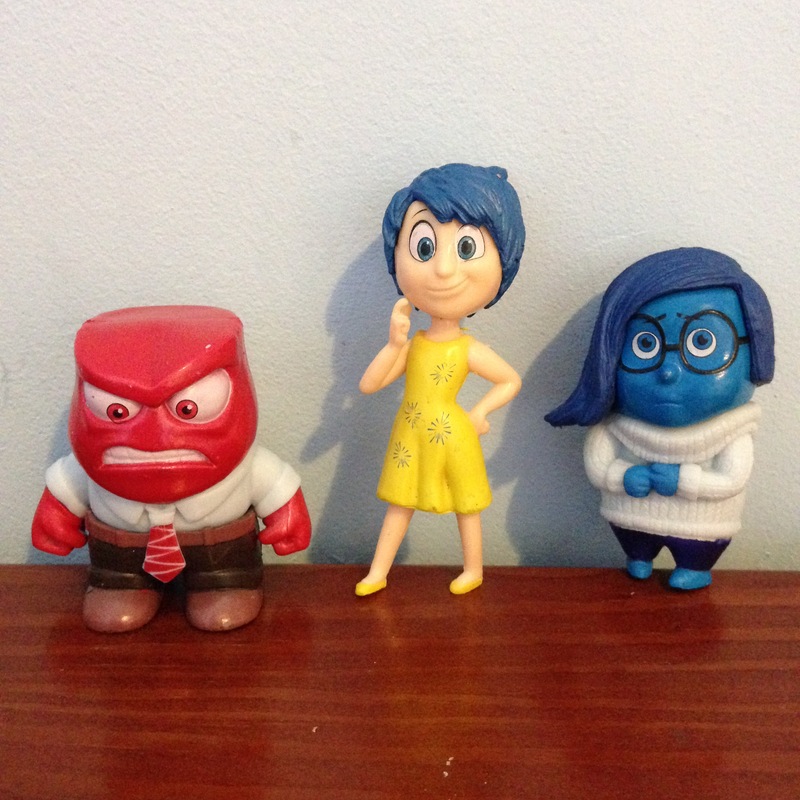 One of the new resources I bought this week are the characters from the film Inside out. I used the joy, sadness and anger ones to help talk to children about those feelings. These were a big hit with the children. I don’t think any of the 4-year-olds I worked with had seen the film, but they all loved the characters, particularly the angry one. I have been thinking a lot over the last few days about the wide range of emotions I have experienced in the last few weeks. 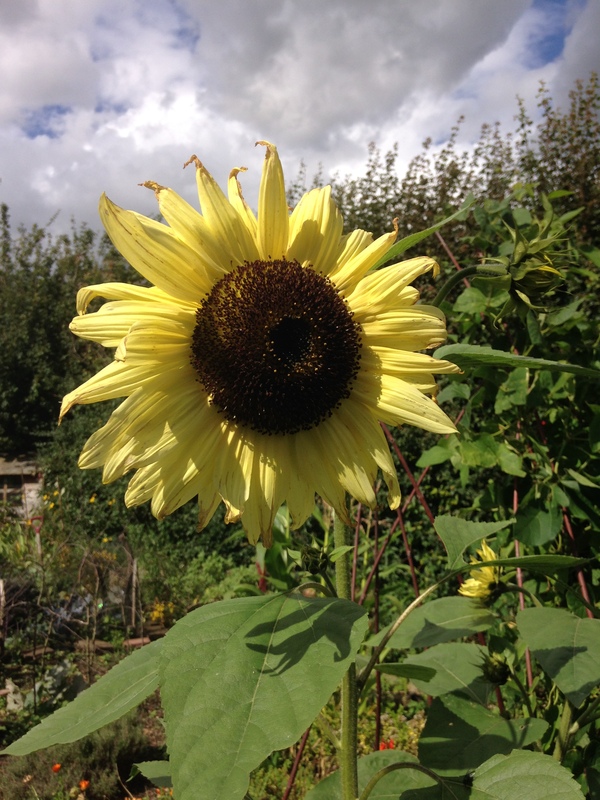 It has been a real mix of shared delight, joy and laughter, celebrating a friend’s birthday and another friends wedding; but also having tears of distress and great sadness with a friend over the phone, on hearing that her cancer has returned in many places. The feelings and emotions have been very raw and very powerful. This term I have also spent a lot of time with children, while they are in rages and at other times utterly distressed. I have also sat with teachers and TA’s while they have cried over the deep concern they have for the children they care for. All of these feelings and emotions are important, it can be hard sometimes to sit with them, to let them be. So often we feel the need to chase the strong feelings away, or bury them, particularly the hard ones. We often try to distract children and tell them they don’t need to be sad, but this doesn’t help us and it doesn’t help children to understand their feelings. This last year has reminded me that allowing ourselves to acknowledge the emotions we have, allowing ourselves to recognise the emotions we are experiencing is fine. As adults we need to be able to recognise and accept our own feelings and emotions to be able to support children with theirs, and we need to help children to learn that their feelings and emotions are not bad or wrong. Throughout my career, I have learnt the importance of celebrating small achievements. So often we can be fixated on the idea of big achievements and can miss the small details. Early in my career, I worked with children with non-organic failure to thrive; young children who refused to eat. My role was to support families and help to encourage the children to eat. I learnt early on in this role to celebrate the small details. I would often sit with a family during a meal time and exuberantly show delight at a child for eating a pea, even if they ignored, threw and refused to eat the rest of the meal. I would be celebrating with the child and the parents for the one pea that was eaten. It’s similar in my role now, often finding myself searching for those small details of change and helping staff to celebrate the small positive changes. My delights this week have been, a girl agreeing to play and explore the “Frozen” themed play dough I had made, seeing a child agree to come inside after only being reminded three times and not having a tantrum, and seeing a year 1 child begin to write 2 words. These are small events, they are things which most other children aged 4 and 5 would do easily, but for these children they were small and important achievements; and small achievements is what we need to celebrate. It can be the same for ourselves, in own lives. Often we don’t recognise the small things we do achieve as adults. For the last two weeks, I have been frustrated and cross at myself for not managing my time well and not finding the space to sit and write and start a new project. This weekend I decided I needed to be kinder to myself. To stop being irritated at what I haven’t achieved but instead, find joy in what I have achieved. Changing my way of thinking has helped me to find a bit of space, to start writing and planning and more important it has helped me to find some calmness and acceptance. When the way forward in our work is unclear. 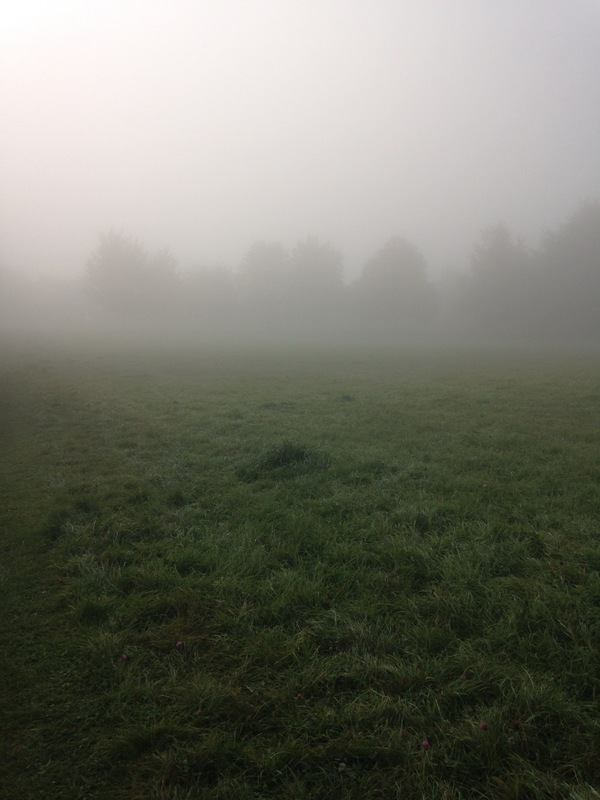 There are times working with children when it can feel as if everything in front of us is misty and unclear. For early years workers and educators, there are clear guidelines about the development that children are expected to make. There are increasing numbers of hoops our children need to jump through and an increasing number of targets to be met. For some children these targets are set far too high; they may be aged four but they could be working at the development of a two-year-old or younger. It can be hard for the educators working with these children to know how to move forward, and how to scaffold and extend the child’s learning. The way forward can be misty and unclear. My role is supporting staff working with children who are finding it hard to transition into school. These children often don’t meet the development guidelines for their age. I have had many conversations over the last few weeks about the way forward for these children, and about how we might adjust our expectations and our way of working to meet their individual needs. To find a different path through the mist. I am really aware that it is so easy in my role as a nurture specialist to advise, support and try to guide the staff, but the really hard work is for the teacher to be willing to step away from the usual path they take and to try new things. To take risks and to accept that the mist will probably not clear quickly. This can be a scary path to take and one which often means letting go of some control and being willing to be a co-explorer with the child. When you are caring for children- how do you take care of yourself? Working with and looking after children is such a rewarding job. I love my role of supporting children in school who are finding the transition hard, but often this work can be challenging and draining. If we are not looking after ourselves we can’t look after the children we care for. If our own well-being is low, we are unable to care for and nurture children to our full capacity and we are unable to fully help them develop a positive well-being. During the last year I have had many conversations with teaching assistants and teachers about how they look after themselves; encouraging them to think about how they nurture themselves and love themselves. These are such essential ingredients if we are then able to go on to love and care for the children we work with/ look after. Often this can be a challenge when we are tired and worn down, but this is when it is particularly important to take care of ourselves. It is only the beginning of a new term and new school year, but already I am seeing staff looking tired and stressed. This is the time when we need to start off by putting things in place to look after ourselves. For a variety of personal and work reasons the last week had been a hard long week- some weeks are just like that. 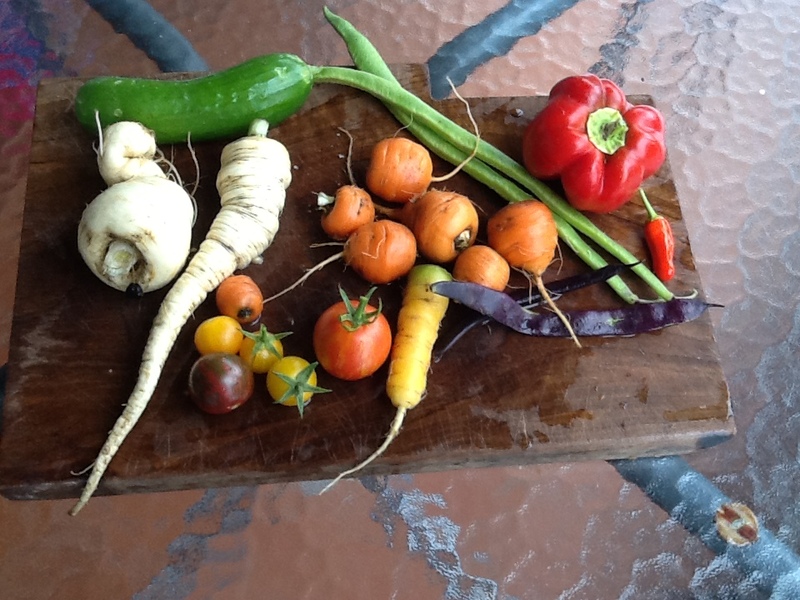 Fortunately, over the weekend, I had some nice things arranged to help feed and nurture my well-being. 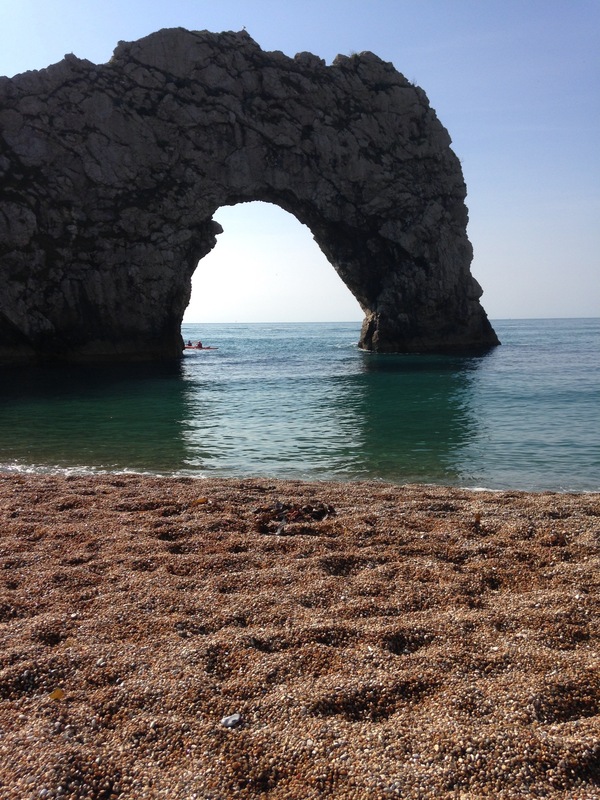 A mix of swimming in the sea at Dorset, watching red kites search for prey, and some moments of great laughter with old friends ; these have all really helped to re-nourish my soul and help me feel once again refreshed and ready for this next new and exciting week. How long do we expect children to sit on the carpet in school/ nursery? How long do we expect children to sit? It’s a new term and I am back into schools, in reception classes. I have been struck once again by the need our school system has to make children sit down on the carpet. My gut feeling has always been that this is unnecessary for young children; more than that, it is unhelpful and unrealistic. This week I have seen 4 and 5 yr olds sitting on the carpet for over 30 mins; this is too long. she advocates that children (specifically those under 7) need at least one hour a day playing outside. She goes on to explain how children need “rapid vestibular (balance) input” every day. She describes this as the opportunity to go upside down, spin around in circles, and to roll down hills – all wonderful examples of outdoor play. By enabling children to do this, their balance system will develop effectively. Until this is effectively developed she argues children are not able to sit and concentrate. I found this really fascinating, for how often do we hear children being told by teachers, early years workers, and from parents not to roll down the hill, and not to hang upside down on the bars? I regularly see children who really struggle to sit still, who fidget and roll around on the carpet. I see other children who are labelled as being naughty because they won’t comply with the rules of sitting for an extended period. My question is always why are we asking young children to sit on the carpet? What is the child telling us through their behaviour? how are we listening to children about what their needs are? Some of the best early years practice I have seen is from those practitioners who really tune into what the children are telling them and what children need; who have very limited times when the children are sitting on the carpet. We need to ensure that we enable children to play and learn through play and exploration, especially outside. We need to allow our children many opportunities to spin , roll, balance and hang upside down, and most of all we need to make sure our young children are not sitting on the carpet for too long. our young children are not sitting on the carpet for too long.